Built 1946, Wolverton, Diagram 2115. SRPS Core Collection, on display. LMS passenger maroon. One of the main justifications for some of Scotland's lines, most particularly those from Inverness to Kyle of Lochalsh and the extension of the West Highland railway from Fort William to Mallaig, was to open up the market for fresh fish. This van is a survivor of the many special vans that carried fish to market from the Scottish west coast fishing ports. 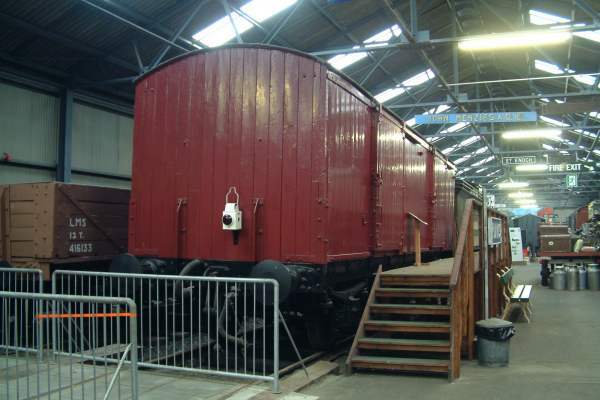 It was designed to be run in express freight trains or be attached to passenger services, and so was built to passenger vehicle standards with vacuum brakes and a through pipe for steam carriage heating. The fish were loaded in wooden boxes, packed with ice to keep them cool, and the floor is sloped towards the centre-line so that the water can drain away.